SAN NARCISO, Calif. (Bennington Vale Evening Transcript) -- Russian President Vladimir Putin, the ironic international interlocutor for territorial sovereignty, condemned U.S.-led airstrikes on Syria this week, excoriating the West’s aggressive actions as lacking “authority without buy-in from Syrian President Bashar al-Assad,” a point Moscow emphasized to the United Nations Secretary-General. Perhaps unbeknownst to Putin, his friend al-Assad, who has decimated thousands of his own people since the 2011 rebel uprisings in his country, is not only buying into the bombings, he’s giddily cheering on American military forces for their assistance in wiping out even larger numbers of the Syrian civilians he detests. Al-Assad added that he was sending President Obama a fruit basket and warm letter of thanks. In 2012, human rights organizations reported that over 7,000 Syrians had been slaughtered by al-Assad’s regime, with countless other thousands injured since the first stirrings of the rebellion. An additional 37,000 were reported to have been imprisoned and tortured. Flash forward to 2014. A Syrian defector produced evidence -- some 55,000 images -- documenting al-Assad’s massacre of 11,000 civilians. The informant also claimed that the torpid-ophthalmologist-turned-brutal-dictator has now jailed 150,000 innocents, whom he will likely torture or kill. 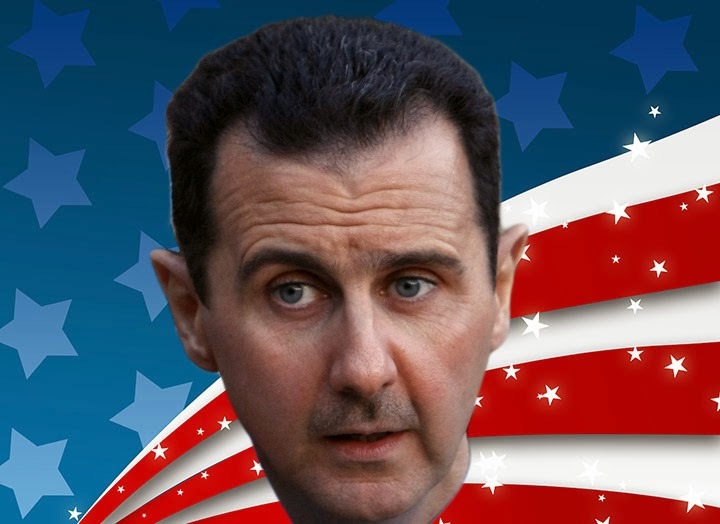 In March 2011, when al-Assad’s use of chemical weapons against civilians became incontrovertible, the White House threatened armed intervention. This week, President Obama acted on those threats, but primarily in response to the growing menace of ISIL, a homegrown rebel group originally opposed to al-Assad which has now become a terrorist organization committed to murdering Americans and their allies. Is there oil? Is there a dictator? Is he one of ours and still active? Can the country defend itself? Will any of our “allies” have a problem with us attacking? The newly amended criteria include a sixth factor, which was inserted as a follow-up to the fourth. Does this country actually have WMDs (like, real ones), and are the victims sympathetic to Western audiences? Regardless of America’s agenda or intent, al-Assad views the deadly airstrikes as a generous largess from his perceived opponents in the West. Not only are military forces poised to destroy ISIL strongholds -- U.S. state-sponsored terrorists and enemies of Syria’s ruler -- they are also likely to take out members of the al-Nusra Front and substantial portions of the Syrian population that al-Assad abhors. To repay the kindness, al-Assad promised to send vast stores of anthrax to the United States, after learning that scientists at MIT had discovered a way to destroy cancer cells using the disease as a delivery system for antibodies.